Taking inspiration from Arts & Crafts and classic American decor, this table will make any living room feel more homey. The table features a traditional parquet top and a cozy brown wood finish. Metal hardware and geometric metal accents boast a dark antiqued finish. Table features one drawer, one shelf, and a flip top. The Parkway Casual End Table with Flip Top by Klaussner International at Furniture Barn in the Pennsville, Bear, Newark, Hockessin, Middletown, New Castle, Townsend, Talleyville, Wilmington, Marshallton, Smyrna, Elkton, area. Product availability may vary. Contact us for the most current availability on this product. Storage Flip top. One drawer and one shelf. When choosing furniture, pick pieces with that feel approachable and add functionality to your space. This collection is a great example — these tables may be workhorses, but they have such a warm and welcoming personality. 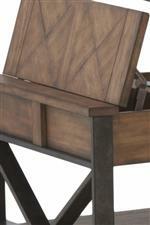 Each piece boasts parquet-style wood veneer tops and rustic, dark metal accents. The signature pieces in this collection also have convertible functionality, like a sofa table that converts to a desk and a coffee table with a lift-top study station. The Parkway collection is a great option if you are looking for Casual Mission furniture in the Pennsville, Bear, Newark, Hockessin, Middletown, New Castle, Townsend, Talleyville, Wilmington, Marshallton, Smyrna, Elkton, area. Browse other items in the Parkway collection from Furniture Barn in the Pennsville, Bear, Newark, Hockessin, Middletown, New Castle, Townsend, Talleyville, Wilmington, Marshallton, Smyrna, Elkton, area.